Vladimir Putin’s hopes for a brief honeymoon after Russia’s utterly predictable and boring presidential election were quickly dispelled. While Western observers are captivated by the fallout from the lurid poisoning of a former Russian double agent in the UK, a sweeping wave of new U.S. sanctions, and the Syrian regime’s use of chemical weapons against its own people, Russians have focused on events much closer to home. 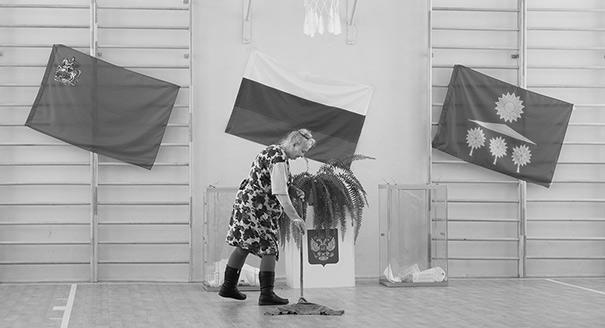 These events stripped any value from the seemingly enormous figures of support for Vladimir Putin recorded at the election: those indicators were measurements of indifference and passive conformity, evidence of perfunctory voting. The authorities exist in one dimension, while real life exists in another one entirely. To explain the phenomenon of mass voting for Putin, it’s enough to recall classic crowd mentality—that it’s best to go with the flow and stay in the mainstream—and the medieval concept of the king’s two bodies: one living one (the body natural), the other symbolic (the body politic). The majority supports the body of the king. Putin is a symbol of the country, synonymous with Russia, he is its main brand, and in this symbolic dimension he has substantial support. The president is a flag, an object of self-identification for the majority, and the election was a tool of this same self-identification: I am Russian, therefore I support Russia, therefore I support Putin. In this context, the election was a vote for a national leader. It was more about acclamation, a loud expression of approval. Today, acclamation is the extent of the pro-government majority’s participation in politics: nothing else is required of them. The president answers for the symbolic renaissance of feelings of belonging to a great world power, while it is mayors, regional heads, and ministers who answer for fires and rubbish dumps. Putin is a protector of the ties that bind, he is an ideologue, the protective border around the fatherland. He is the final recourse, whose intervention is sought in extreme cases, a complaints procedure invoked when things are very bad indeed. But even this, the least of his functions—most clearly demonstrated during his televised phone-in show—is petering out against the backdrop of dismally low expectations for his fourth term: despite the gravity of the situations in Kemerovo and Volokolamsk, there are few voices appealing to Putin or demanding his resignation. After all, does appealing to a portrait on the wall, or demanding that it be taken down, change anything? This is in fact the challenge of the fourth term. If Putin ceases to be perceived as a savior, as someone who always comes to the rescue, then his real, non-symbolic incarnation—the body natural—risks shrinking until it is invisible. Putin is a constant, but people can and must live without him, because symbols don’t decide anything in practical terms. They are like the radio or TV, background noise and music. In the symbolic reality, Russians are diehard patriots and the sworn enemies of the West. In real life, they are patriots of themselves. The elites behave in exactly the same way, devoting themselves to Putin’s Russia while sending their children abroad en masse to study at prestigious universities. In this dichotomous world, the symbolic Putin is omnipotent, like Saint George slaying the Western dragon, but the flesh-and-bones Putin is barely capable of solving Russians’ everyday problems or preventing tragedies. The powers-that-be control the world, but are incapable of ordinary empathy and non-official compassion. After eighteen years in power, Putin has set the universal standard for his body politic. The Vladimir Putin of his first term and the Vladimir Putin of his fourth term might be somewhat different people, but they are still incarnations of the same king. After Putin will come … Putin. Even if it isn’t physically Putin, it will be the same kind of leader as Putin. In focus groups held at the Levada Center independent pollster, respondents often argue that even if presidential candidate Ksenia Sobchak or opposition leader Alexei Navalny were to win the presidency, the leader would behave just as Putin does today. The authorities have an abstract positive scenario, namely, the continuation of the previous, inertial path: this is why Putin didn’t need a preelection program. And this previous path, which has been worn in over the past eighteen years that Putin has been in power, should now, according to some mystical logic, result in a breakthrough: a thoroughly Soviet concept. But a breakthrough should have an aim, such as building Communism (as under Nikita Khrushchev) or overcoming the risks of falling behind (the goal of Stalin-era industrialization). The aims of this “breakthrough,” along with its outline, tactical and technical specifications, and the resources to be used to achieve it, have not been named. A positive plan of action has, however, been presented to the authorities, and this is the program developed by the Center of Strategic Development chaired by former finance minister Alexei Kudrin, titled “Strategy for the Country’s Development in 2018–2024.” It was first presented in its basic form to Putin back in May 2017, and is addressed not so much to the elites or to the wider audience as to the head of state, since he is seen as the only possible subject of top-bottom modernization. No political consensus concerning the program’s complex realization has been reached, but a mechanism has appeared for constantly renewing proposed reforms. This is not necessarily such a bad thing in itself, but it severely fragments the process of establishing reform tasks. The end result is something akin to drawing up the program for making progress in science and technology that was fine-tuned in Soviet times over many years and slipped quietly into oblivion with the collapse of the target of reform: the Soviet Union. All attempts at top-bottom modernization—the Gref Program in 2000 (an economic reform strategy drawn up by then economic development minister Herman Gref), those of the Institute of Contemporary Development (INSOR) think tank under the presidency of Dmitry Medvedev, and Strategy 2020 prepared for Putin’s third term—have ended up resembling an economic menu for senior officials rather than an action plan or road map, not to mention the fact that their implementation would have required political will. Those programs were not perceived by Putin and Medvedev as their own, and both presidents saw a multitude of risks in them. In addition, not one of those programs, with the exception of individual projects devised by INSOR, touched on the political sphere and the political foundations of the system, which have with time become less and less flexible, as well as increasingly unsuited to carrying out any reforms of substance. If Putin didn’t resolve to undertake structural reforms in better times, he’s certainly not going to do so now, but that’s not the only issue. The system that has been built simply isn’t oriented toward development, even in theory. Its foundations are laid on the idea of collecting rents from a small elite group that acts as a bridge between those in power and the country’s assets. The only possibility is a certain rationalization of politics within the existing regime, the increasing influence of the state on the economy, and the continuing concentration of resources in the hands of a few clans, accompanied by a permanent state of adaptation to the outside world, sanctions, and worsening relations with trade partners. The main prejudice in Russian political discourse is a perception that reform is painful and unpopular. However, certain proposed reforms will not necessarily be painful. For example, if the retirement age is raised, it will not affect the current generation of pensioners. Working on the basis that the life expectancy in Russia will continue to grow, and that by 2030 one in three Russians will be receiving a pension, then raising the retirement age is not even a reform, but simply one of many measures that can be deployed to help stave off the financial collapse of the pension system. The additional 2 percent might be redirected to healthcare in a taxpayers’ democracy. But in authoritarian regimes, that extra income is highly likely to be turned into extra spending on something else, such as buying the electorate’s loyalty with social payouts at the right time and place, or new kinds of missiles with truly amazing capabilities. Given the ostensible clarity of the unwritten ideological foundation of the regime—coming together and mobilizing for the battle against common enemies (Hannah Arendt’s “dread of the universal stranger”)—the elites appear to suffer from a severe lack of ideology. This deficit of ideas was particularly noticeable when Putin delivered his state of the nation address to both chambers of the Russian parliament on March 1, 2018. It played a galvanizing role, but if there were any ideas in it, particularly concerning budget spending, then they were not backed up by resources. In terms of basic accounting alone, the first part of the address (the economic and social part) was incompatible with the second part, which promised new—and expensive—military wonders. The suicidal logic of the lethal weapons went down like a storm with the public, and Putin’s words were greeted with broad smiles and ovations—but only because hardly anyone actually believes they could come true. The president was trolling the West, scaremongering with his imaginary weapons, almost joking. The deadly force was provisional, cartoonish, like a game; something unreal, or an imitation of the real thing. And foreign policy is built in the same way, using the same theatrical effects designed to elicit approval and mobilization from the domestic audience. This primitivization of the Russian foreign policy playbook, and this mirroring of the actions of a hostile West in the form of “action, reaction” without any tactic or strategy, reveal the lack of any meaning, either political or ideological. It is the imitation of a battle for supremacy in world politics, when in fact the battle is merely to claim even the slightest bit of visible influence. The reputation of a bête noire is not the same as being a heavyweight in world affairs: Russia’s economy is small, and its military might is overestimated. Russia is only becoming (self-)isolated from solving the key issues of what remains for now the world order. 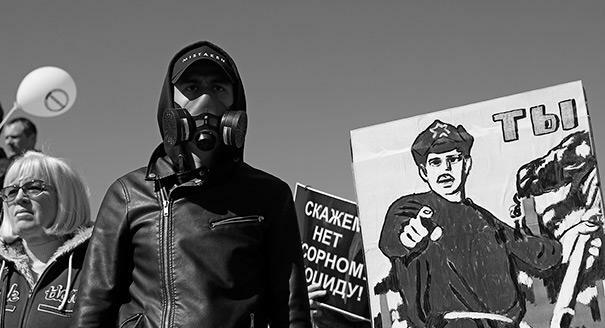 Russia can still be an influential spoiler, using escalation to expose the West’s weaknesses. But the final political outcome only results in Russia’s further isolation. A prominent Russian economist, Evsey Gurvich, following another economist Sergei Guriev, names this process “deglobalization”: the West cuts Russia off from global markets through sanctions, as Russian countersanctions simultaneously exacerbate its own alienation. Having announced the idea of a breakthrough but failed to back it up with any substance, Putin let it be understood that, in reality, at least the beginning of the fourth term will be a repetition of the third term. The only difference is that there isn’t a second Crimea, and a new basis for political mobilization has yet to be found and formulated. Despite the apparent impermeability and strength of the powers that be, they have still not managed to master a contemporary language in which to speak to the nation, not just because during the years of authoritarianism the culture of dialogue and the practice of listening to an opponent or petitioner have disappeared, but because this was never the task: Putinesque tones of voice and the old political dialect of the semi-Soviet state kind sufficed. However, to at least compete with Alexei Navalny and hold conversations if not with the political opposition then at least with non-political civil movements—including people driven to despair by disasters both manmade and ecological—they will eventually have to try to get a handle on this new language. Politics, and indeed all aspects of life in Russia, are still associated with one figure, and this person formulates the country’s external image, among other things: few strive to distinguish between Putin’s Russia and Russia itself, between the state and society, between the political regime and the country. Identifying the ruler with the country, and the leader with “his” people, is not the most flattering testimonial. The end result is a sovereign of the Carl Schmitt type, and we all know whom Carl Schmitt served. Onto the stage return the masses, forcing us to return to the concept of reality of another thinker from the past, José Ortega y Gasset. The revolt of the masses and the appearance of a timid “average man” is an old trick, not a new one. Another thing the world has seen before is the disappearance of the unshakable legal foundation of state and society: increasingly often, decisions are made not based on the letter and spirit of the law, but as a result of the interpretation of regulatory acts. This phenomenon of the dual state is plain to see: there is the regulatory state, and there is the prerogative state, which knows better how to interpret the meaning of regulations, and which issues rulings and sentences based on the political atmosphere in the country. The state is becoming more and more authoritarian, and this is happening not as the result of a coup or any other dramatic actions, but slowly and gradually, with the disintegration of institutes of democracy, the erosion of previous norms and values, and the encroaching of the borders of what is permissible at the expense of what was previously morally impermissible. This is particularly true of the ideological discourse that dominates not only federal TV channels, but other media too, where political self-censorship and the use of a simplified and archaic language of hate are becoming the norm. The state has taken on the function of a higher moral authority with the aim of compensating for the lack of distinct ideology. Again, there is nothing new in this management technique. In his book Contesting Democracy: Political Ideas in Twentieth-Century Europe, Princeton professor Jan-Werner Müller notes that the majority of authoritarian leaders have engaged in what can be described as the rhetoric of moral instruction: they didn’t try to ignite people’s political passions, but instead strived to remind people that they should return to the traditional values of work, family, and the fatherland, and that any of the day’s difficulties must be weathered, since the past was a time of depravation and godlessness. But as a result, the moral agenda is becoming a minefield for the authorities: increasingly frequent disasters, coupled with both a technical and a managerial inability to deal with them, deprive the authorities of that precious instrument that is the moral high ground. The moral hypostasis of the Russian authorities, in which perceptions of “our” moral rectitude in the face of the aggressive West continue to prevail, has been left behind in the symbolic dimension. In real life, the powers that be are turning into a helpless and immoral authority. The collision between these two dimensions of Russian politics will be the main conflict of Putin’s fourth term.